We ate these Chocolate Waffles the first time for dessert topped with black raspberry ice cream and a triple-berry sauce. The kids convinced me they would also be good for breakfast the next morning, without the ice cream but with whipped cream instead. I don’t think that really changed the sugar content any! 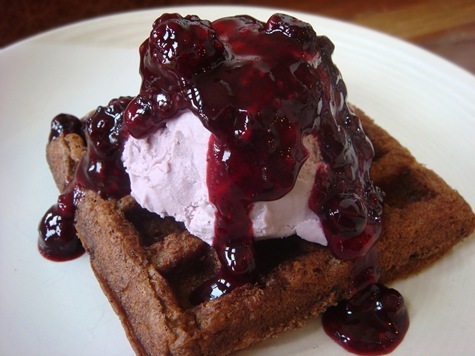 These chocolate waffles are not too heavy, but with the addition of mini chocolate chips in the batter and topped with ice cream and berry syrup, they are reminiscent of a brownie sundae. Next time I would like to try them topped with vanilla ice cream and buttermilk syrup. Combine flour, cornstarch, cocoa powder, baking powder and soda, salt and cinnamon. Use a whisk to combine. In a separate bowl whisk together milk, oil, sugar, egg and vanilla. Whisk for a minute so it gets a little frothy. Slowly add the wet ingredients into the dry a little at a time, whisking to combine. Just stir until they’re combined and don’t over mix. Use a ladle or measuring cup to pour batter evenly into hot waffle maker (about 2 scant cups for the 4 small Belgian waffles in my waffle maker). Sprinkle about 1/3 of the chocolate chips (for a large Belgian waffle maker) over the batter in the waffle iron. Spread lightly with a heat proof spatula so that a small amount of batter covers chocolate chips. Cook for about 3-5 minutes, or according to directions on your waffle maker. Remove waffles from waffle maker and place on a wire rack (not a plate). Serve immediately or keep warm in a warm oven (very low heat).